MIAMI (AP) — The principal of a South Florida high school has been removed from his position after expressing support online for a Texas police officer who waved a gun at black teens while responding to a call about an unruly pool party. The Miami-Dade County school district announced Wednesday that Alberto Iber had been removed as principal of North Miami Senior High School and reassigned to administrative duties. In a public post on a story about the Texas incident on the Miami Herald’s website, Iber wrote that Officer David Eric Casebolt, who has since resigned, did nothing wrong and was afraid for his life. 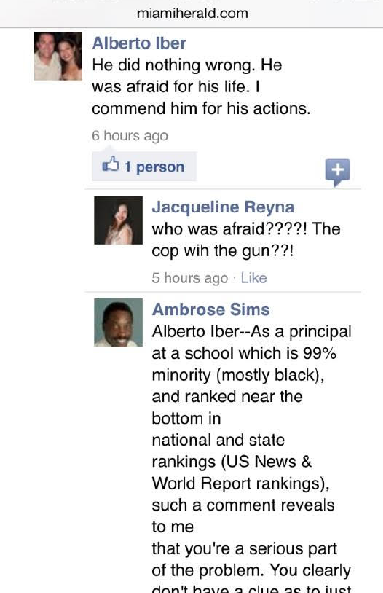 The post included Iber’s Facebook picture, name, school and title. Iber told the Herald that he supports law enforcement and was sorry if his opinion upset people.